Marblehead Pottery started out as a modest therapy program in a sanitarium and developed into a successful business. In order to better understand how this happened, you have to credit the work of one Arthur E. Baggs, a master of pottery who spearheaded the entire operation. Baggs was the chief designer and creator of Marblehead pottery and is directly responsible for the enduring quality the pottery has in today’s market. In 1904 Dr. Herbert J. Hall began Marblehead Pottery. He housed his practice and therapy operations in the breezy seaside New England town of Marblehead. One year later, Dr. Hall was fortuitous in hiring Arthur E. Baggs, an accomplished potter. Mr. Baggs ultimately developed the incised, restrained and stylized decorating style featuring delicate painting and muted colors so characteristic of Marblehead. In 1915, Arthur Baggs assumed full ownership of the small enterprise. Full production began in the 1920s. For a brief duration, Baggs was also a professor of Ceramics at Ohio State University continuing to run Marblehead Pottery during his summer break. Even at the height of production, he maintained a small staff. In 1936, Marblehead Pottery closed its doors. Integral to the architecture and interiors of its period, Arts and Crafts Pottery was widely collected and typically displayed in the fumed- and quarter-sawn oak cabinets of the early 1900s produced by such manufactures as Gustav Stickley. 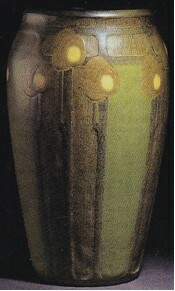 As early as 1907, exhibitions that included Marblehead pottery were on view in Boston and New York. According to Ulysses Grant Dietz, a known specialist and curator in Art Pottery at the Newark Museum, the shows may have caught the attention of John Cotton Dana of the Newark Museum and Library who was planning an exhibition in 1910. 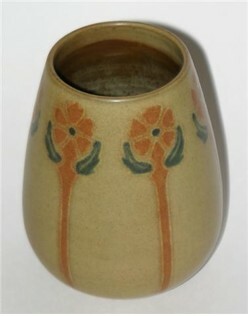 The museum purchased some well-executed examples of early production pots on loan, the most expensive selling for $10. These six pots, some recently on view at the exhibition Masterpieces of Art Pottery, and now part of the museum’s permanent collection, are some of the most valuable and finest examples of Marble Head pottery existing today. Other examples can be found at the Marblehead Museum and Historical Society where catalogues and records are maintained in the archives. Important attributes of Marblehead pottery are hand applied and painted matte mineral glazes, alternating stylized patterns found in nature, incised and painted over subtle pebble finished grounds of contrasting color. Typical colors are blue, green, pink, mustard, brown or gray. They were finely thrown in red clay and were ovoid, squat, pear, and beaker-shaped. 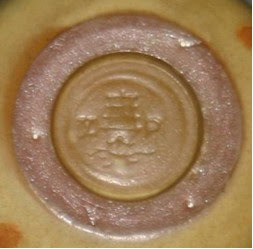 The determining mark is the impression of a clipper ship on the base of the pot with the letters “M” and “P” on either side. Auction activity for Arts & Crafts Pottery peaked around 2000; the frenzy for collecting has stabilized somewhat due to a shifting economy. A very limited supply of quality pre-production Marblehead Pottery in the open market combined with restrained collecting have led values to continue slowly rising.